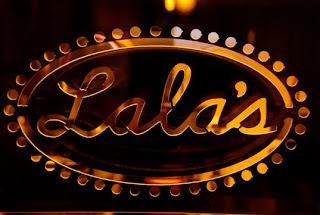 One of the newer restaurants on the Denver scene is Lala's wine bar. On one of the hottest corners in the city, Lala's competes with every other Governor's Park hot spot. Needless to say, they have their work cut out for them. So this begs the question, are they cut out for it? 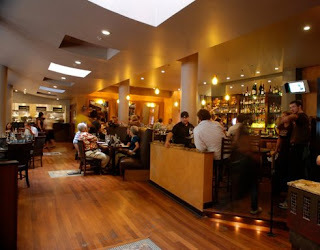 Recently noted in Westword's BEST OF DENVER, Lala's was bestowed with the honor of Best Wine Bar. That's quite a feat for a brand new spot with only a few notches in the belt. Naturally, I ran to see what all of the hubbub was about. Turns out that I wasn't the only one. The place was packed. Granted we were there during prime time, but luck was on our side as three seats opened up at the bar. Best wine bar? Shouldn't hurt sitting at the bar then, right? Needless to say, I was a fan of the wine list. Not only was it diverse in varietal, but also encompassed a solid geographical range and it won't empty your pockets. Can't beat 3 half-glasses for $12. This is a great way to give your guests a specialized sampler of choice wines. They can also pull it off because of their temperature-controlled wine tap system. It keeps all of the wines stored at ideal temperature with a closed system to prevent oxidation. If only they could store all of their bottles by the double-magnum. I sympathized with the bartenders who had to constantly maintain the system and flip bottles out on a busy Saturday. Needless to say, the distraction of the elaborate system caused to service to suffer. In hopes of having a well-timed multi-course meal, we only pulled off the latter half. Their bar menu is classically elegant and looks great in premise with a fair selection of cheese and charcuterie (and knowledgable staff to educate), but the scene is just too busy to expect good timing. Really, 40 minutes for a cheese plate? I'm just glad we didn't ask them to bake a pizza or anything. Also on the menu are various pastas, antipasti, sandwiches, and other traditional mediterranean cafe fare. We chose the paella, one of those dishes that is hard to avoid. Understanding what we were up against, we requested some extra focaccia to keep us going for the impending wait. Especially since our bartender warned us that it would take awhile. We were super surprised when our paella flew out of the kitchen no more than 20 minutes later, yet no bread. I'm a sucker for a good paella and was bummed to find out that this one was a big step short. I'm sure Webster would define his paella with a healthy serving of rice in the mix. Lala's skimped on this, turning a promising dish into more of a mediocre gumbo. Now don't get me wrong, Lala's doesn't miss the mark on the atmosphere. 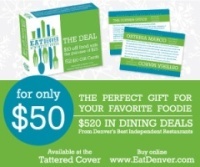 This is definitely a good place to get your Denver on. With a tuscan style interior of oranges, reds and browns, and a hip trendy flair, don't expect the tops in terms of service and cuisine. A good place to get a drink after a fine meal down the street, no names mentioned. Although I'm not running back, Lala's gets some things right. It's likely that they will never lack the crowd due to stellar location and an attractive concept. My recommmendation: I say they're about halfway on the spectrum. To be generous (and to stick to the scale), medium-well. I went when it first opened its doors in 2008 and had an underwhelming salad and a flavorless pizza that sounded mouthwatering on the menu. And judging by the success of Sparrow, I disagree that their location will keep them packed. After one visit to LaLa's and I was wishing I had frequented Sparrow more often to keep it alive. I encourage you to come back and try us again. We have certainly made some changes, and with almost two years under our belt our service has excelled. My name is Alexandra Parks, and I work the bar four nights a week. I'd love to take care of you.